Actress/designer Kelly King and Founder Hanne Fellers just arrived in Vancouver preparing for ECO Fashion Week kicking off this Sunday at the Fairmont Waterfront hotel in downtown Vancouver. We are really excited to showcase our newest Love and Compassion Fashion Line along with amazing eco-friendly designers and brands. We are especially excited for the debute of H&M’s Conscious line. 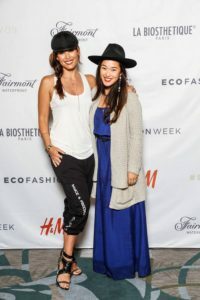 Check out the: ECO Fashion Week Website for details.